Which are the Most Nutrient Rich Foods? Home > Vitamin Basics > Which are the Most Nutrient Rich Foods? It’s true that the best way to get all the vitamins you need for great health and fitness is to eat a wide variety of foods. But there are some key foods – and drinks – that can give you a head start when it comes to getting your vitamins day in and day out. Antioxidant vitamins can help to protect our bodies against stresses of the modern industrialised world, such as pollution, and against the wear and tear caused by naturally occurring free radicals in our systems. If you’re interested in staying young looking (and feeling!) and keeping a wide variety of illnesses at bay, you need to think about getting plenty of antioxidants. Antioxidants are found in lots of fruit and vegetables, amongst other things, but here are some key foods to look out for that will give you a big antioxidant boost. 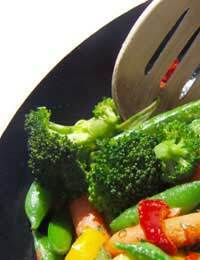 Broccoli:Choose broccoli for a big helping of age-defying, health-giving vitamin C. To maximise your vitamin intake, cook it as lightly as possible – steaming is good. Or simply wash it and chop it and chuck in your salad. It’s crunchy and good for you! When you eat the superfood broccoli you’ll also be getting significant amounts of vitamins A, B2 and K.
Green tea:Believed by many to be the secret of long life and good health in the East, there’s no denying that sipping a cup of green tea will bump up your antioxidant intake. But don’t worry if you find the acquired taste of green tea a little tangy on the taste buds. Green tea and black tea – the kind we drink every day – both come from the same tea plant; Camellia sinensis. The leaves are just processed differently, as green tea leaves are not fermented. So you’ll still get some antioxidants from your regular cuppa. Tea contains a different type of antioxidant from the kind found in fruits and vegetables. They’re called flavonoids. So go on, put the kettle on. For a healthy metabolism, great skin and plenty of energy, look out for good sources of B vitamins. Spinach:Like broccoli, spinach is another superfood. It’s no surprise that a certain cartoon sailor used it to beef up his strength! Rich in vitamin B1 (thiamin), B2 (riboflavin), and B3 (niacin) plenty of spinach will benefit your nerve function, vision, skin and digestive system. On top of that, spinach also contains vitamins C and K. Don’t overcook it, lightly steaming will do. Or try baby leaf spinach and eat it raw. Remember, if you’re not a big veggie fan, you don’t have to eat your spinach in splendid isolation. Put it into salads, pasta sauces, soups or serve it with your favourite meat and potatoes for Sunday lunch. Other great sources of B vitamins include:Peanuts for vitamin B1 (thiamin), the humble baked bean for vitamin B5 (pantothenic acid) and cabbage for vitamin B6 – once again, go easy on the cooking for maximum vitamin intake. You need vitamin D in order to absorb calcium – making it an essential for teeth and bones. Your body can manufacture vitamin D from exposure to sunlight, but you’ll also find it in oily fish, dairy products and eggs. Salmon, tuna and sardines:Eating fish is widely regarded as a key element of keeping healthy and fit. To make sure you get enough vitamin D, cook up a storm with some oily fish. Wild salmon is particularly tasty – you’ll spot it by its dark red flesh. But if it’s a bit on the pricey side for you, sardines are readily available and cost very little. Either try the tinned variety (great on toast) or buy them fresh and pop them under the grill or on the barbecue – very European! Tuna is fab in sandwiches if you buy it tinned, but try a fresh tuna steak now and then. They take only minutes to cook and while you’re getting plenty of vitamin D, you’ll be eating healthy omega 3 oils too. Useful in supporting your vision, as well as skin and bone growth and your immune system, vitamin A is a must. When it comes to looking for great sources of vitamin A in your food, this one’s fairly easy – look out for orange things! Mango, butternut squash, carrots, sweet potatoes, pumpkin:Okay, you can get your vitamin A from broccoli or tomato juice, but thinking orange is an easy way to remember what to look out for. Although, oranges themselves are not a great source of vitamin A – they’re all about vitamin C! Try roasting or mashing butternut squash, pumpkin or sweet potatoes instead of your usual white spuds. They give a deliciously different, smooth taste. You might find you prefer them to more conventional potatoes – many people do. Carrots are a staple around many family dinner tables. Just be sure not to overcook them for maximum benefit. As for mangoes, they are one of the most scrumptious and nutritious foods around. Simply peel them and eat them. But watch out, don’t do this wearing your clean, white shirt as they’re very juicy! This is just a quick guide to some of the most nutritious foods. But the list goes on and on. Avocadoes, strawberries, pomegranates, blueberries, wholegrain rice and tomatoes are amongst the hundreds of foods that deliver a power-packed vitamin punch. So crunch and munch your way to good health – morning, noon and night.